kt literary » Blog Archive » Happy Book Birthday to THE SHOOTOUT SOLUTION! Happy Book Birthday to THE SHOOTOUT SOLUTION! 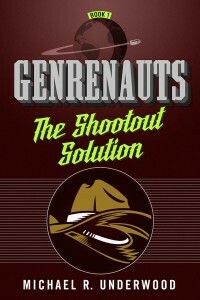 Please help us celebrate with Michael R. Underwood on today’s release of THE SHOOTOUT SOLUTION: episode one of GENRENAUTS, a brilliant science fiction serial packed with humor and fun! Episode two, THE ABSCONDED AMBASSADOR, is set to release on February 23, 2016.